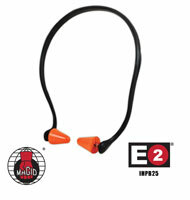 The E2 IHB25 Band Hearing Protector is a new addition to the E2 line. IHB25 is made from lightweight black polyurethane, allowing the flexible headband to fit a range of head sizes. The affixed cone-shaped earplugs are made from hypoallergenic polyurethane foam with a noise reduction rating of 25. Replacement pods are available.